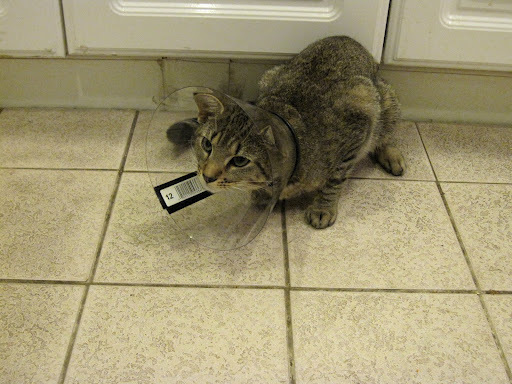 My first cat, Suki, was spayed in Bolivia. When I arrived to pick her up, the assistant said, “They’re just finishing up. Why don’t you come on back?” So I did. Suki was on the operating table. Apparently “finishing up” meant the vet was still putting stitches in. Off to the side, on folded slip of pink toilet paper (only in the developing world do they use pink toilet paper), lay her ovaries and uterus — a “V” of stringy, pink flesh. Suki was still completely knocked out. When I got back to the house, I put her in a cardboard box lined with a soft blanket. At 3am, she woke up and began to yowl and thrash. When I tried to hold her still, she bit me. Bleeding, I rushed to get a towel. I wrapped her up and spent the rest of the night cuddling her. Every time she woke and started yowling, I had to stroke her back to sleep. 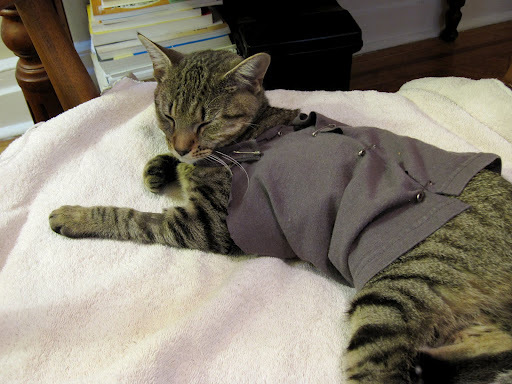 Compared to that experience, Izzy’s surgery was a piece of cake. I dropped her off at 11am. Soren picked her up at 7pm. When she got home she was groggy, but awake. Her pain seemed manageable. But she soon began to lick and tug at her stitches. So we put her head inside the mandatory $18 plastic cone that the vet provided. No dice. She flopped around like a dying fish and then scooted backwards across the floor growling. Next we tried one of Soren’s tube socks. But it seemed too tight. Finally, we got one of my legwarmers around her midsection. That took care of the licking last night, but I was worried that the fabric wasn’t letting the wound breathe. 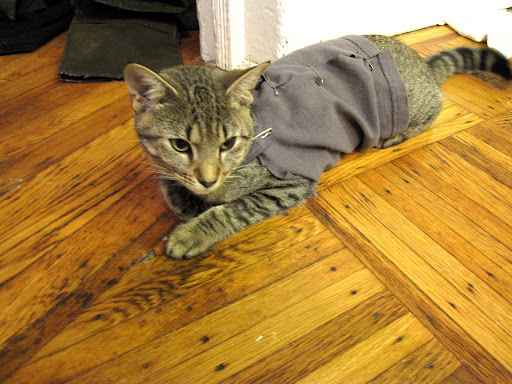 So this morning I made a little t-shirt coat. I cut a rectangle out of one of my old t-shirts, safety-pinned it around her middle, and pinned a strap across her chest so it wouldn’t slip. Dark gray isn’t the best color on her, but I figure it’s all about healing, not fashion. The only downside of having your cat spayed in the US (vs. Bolivia) is the cost. 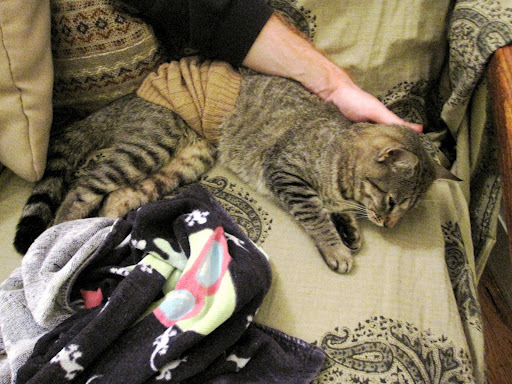 I paid about 200 bolivianos to get Suki spayed (roughly $30). Spaying Izzy cost $237 (and that was with a gift certificate for a so-called “low-cost” spay). I’m still filled with righteous indignation. (C’mon! $18 for a plastic cone that she wore for 5 minutes). What makes me even more angry is that they originally gave me a quote of $87. The surgery went fine, but now Izzy seems to have developed an upper respiratory infection, which I’m sure will mean more money, more antibiotics, and more stress. Sigh. They are expensive little beasts — at least in the US.